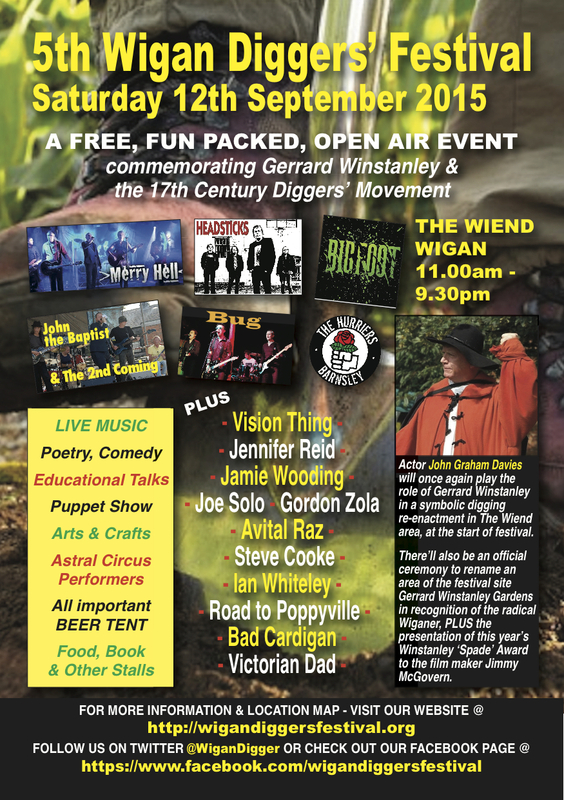 5th Wigan Diggers’ Festival promises to be biggest & best yet! If you’ve been before you’ll know it’s a reet good do. If you’ve not, you don’t know what you’ve been missing. 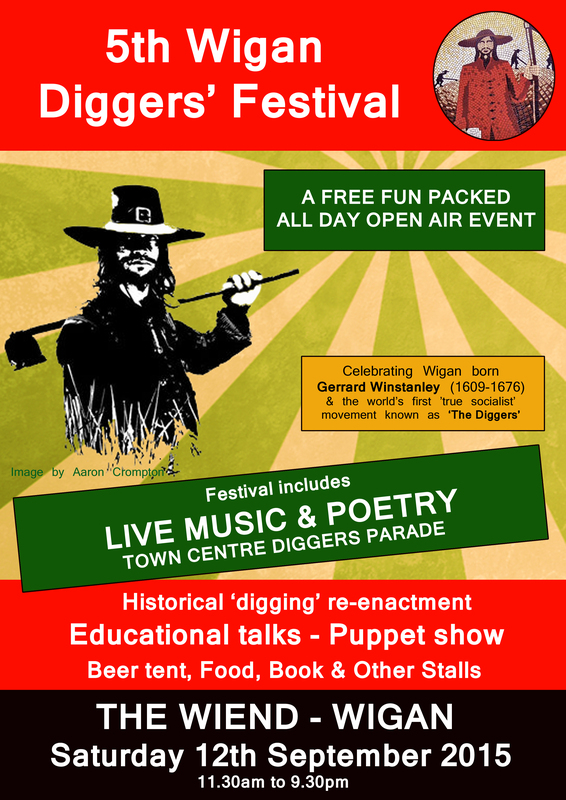 Poster artwork for this year’s Wigan Diggers’ Festival. If you would like to book a stall for your organisation, community group, co-operative or small business at this year’s Festival then please download the linked file, complete as appropriate, and return to the address provided. 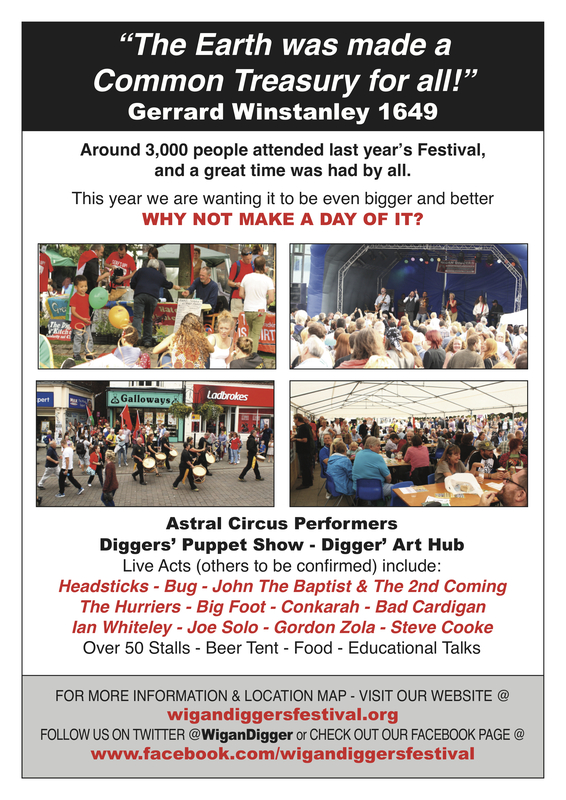 4th Diggers’ Fest Biggest & Best Yet! This year’s Diggers’ Festival was undoubtedly our biggest and best yet, if the feedback from the organisers, and those who attended is anything to go by. While it is difficult to estimate the exact numbers who came along during the course of the day, the crowd was at least 50% larger than last year’s, and surely in the region of 3,000 or more. Some even suggest a much higher figure. Whatever the figure, the main thing was, a great time was had by all, and our aim of raising greater public awareness of Gerrard Winstanley and his ideas, and those of his Digger followers, by means of an annual celebration in his hometown, was once again successfully fulfilled. Here are some fantastic photos by Al Balmer which capture some the day’s activities. Well done to everyone involved. Onwards to 2015. 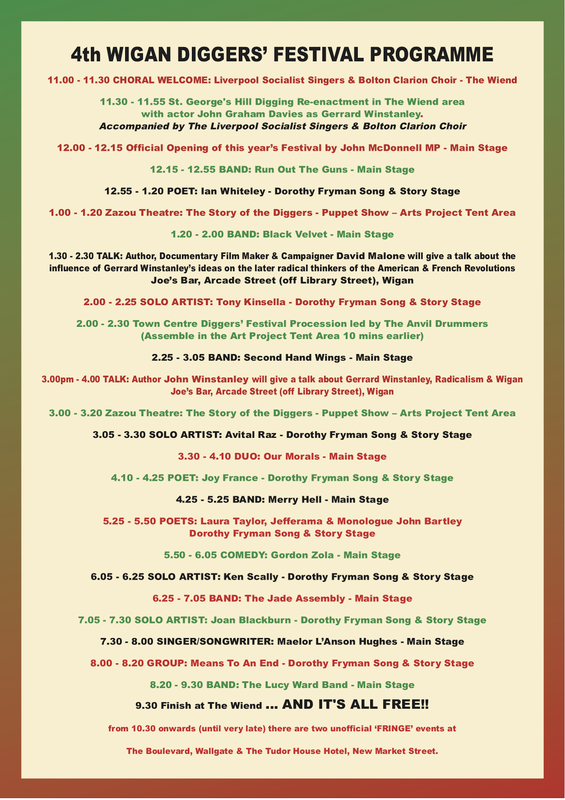 It’s been twelve months in the making, and here it is at last, this year’s final Wigan Diggers’ Festival programme. The organisers believe it has all the makings of our biggest and best yet, as well as an enjoyable, fun day out for everyone. In brief: A feast of 24 excellent bands, duos, solo artists, poets and other performers (amongst them two radical choirs), a historical digging re-enactment, a puppet show, arts project tent, two educational talks, town centre procession, plus over 50 book, food and other stalls, not least of which, our ever popular “Occupie Wigan” Beer Tent serving our own specially commissioned and locally brewed (Allgates) Gerrard Winstanley Ale, (Prospect) Diggers 1649 Ale, (Holts) Resistance is Fertile Lager, and a range of other excellent beers, ciders and perry. The event will be officially opened by John McDonnell MP at 12.00noon. Check out our Twitter feed @WiganDigger or our Facebook Page at: https://www.facebook.com/wigandiggersfestival for the very latest news. Still not sure what this Diggers thing is all about? Then listen to this excellent version of Leon Rosselson’s “The World Turned Upside Down” by the Barracudas from 1985. It tells (almost) the entire Diggers’ story in 3 mins 46 seconds. Definitely worth a listen if you want to get in the mood for the Festival on Saturday in Gerrard Winstanley’s home town.